Of the nearly 100 quadrillion British thermal units of energy (BTUs) used each year in the United States, 61 quads are wasted. That is not a moral judgment, or a commentary on insufficient conservation (poor insulation, idling cars, people failing to turn off lights when they leave a room). It is, as Mara Prentiss notes, predominantly fundamental physics: the fuel is burned, but less than 50 percent performs useful work. That is because the American economy depends on heat engines—such as fossil-fuel-burning electric power plants and gasoline-powered cars—that cycle to convert heat energy into mechanical work. Their efficiency, the Mallinckrodt professor of physics explains, is limited by the laws of thermodynamics. An electric power plant’s theoretical maximum efficiency (its “Carnot limit”) is approximately 50 percent; a car engine tops out roughly 10 percent lower. In practice, of course, actual efficiencies can be much worse (although modern gas-fired power plants approach the theoretical efficiency limit). What this means is that the energy economy of the United States, as currently structured, can never be much more than 50 percent efficient: the laws of physics won’t permit it. Prentiss sees in this fundamental limit to efficiency not an obstacle, but an opportunity. In her new book, Energy Revolution: The Physics and the Promise of Efficient Technology (Harvard University Press), she probes the most basic of questions: where energy comes from, how it is distributed, how it is consumed, and—critically—how it is wasted. 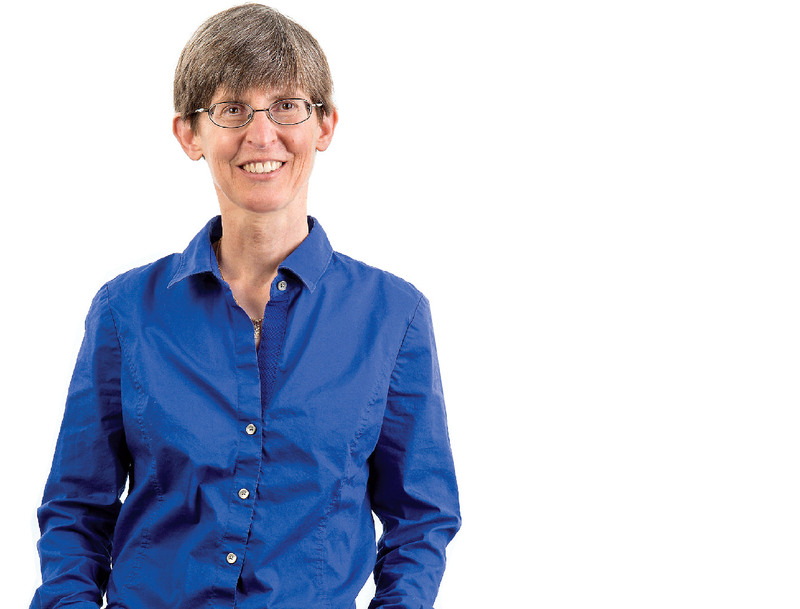 Prentiss is a specialist in the manipulation of matter by light, who now focuses principally on using the tools of physics to answer knotty biological questions. She decided to write her book for a wider audience, given the urgency of the energy problem, the relevance of fundamental principles of physics, and the opportunity to apply her skills to U.S. energy challenges. She aims to show what choices the country really has, and how realistic the path to a sustainable future might be. Without plunging directly into current energy-policy debates, Prentiss offers a uniquely scientific perspective on what she calls one of the biggest single problems facing humanity. Beyond the connection between long-term climate change and the use of energy, and the immediate environmental impact of fossil-fuel emissions (including lead, mercury, oxides of nitrogen and sulfur, carbon monoxides, ozone, and particulate pollution), lies another stark reality: the total quantity of fossil fuel on earth is finite, and so, inevitably, eventually, “We will run out,” she says. What then? Could humanity generate enough power from sun, wind, and water to replace fossil fuels, so that they gradually became a tiny fraction of consumption? Would that require sacrifices, and sweeping lifestyle changes? How difficult would it be to replace fossil-fuel consumption with renewable sources? To find the answer, Prentiss undertakes a thought experiment using wind power. Energy from onshore wind costs 8 cents per kilowatt hour (kWh) for new installations: cheaper than the 9.6 cents per kWh for power generated from coal, but more expensive than the approximately 6.6 cents per kWh for natural gas (notably, the latter two numbers do not include related health or climate-impact costs). 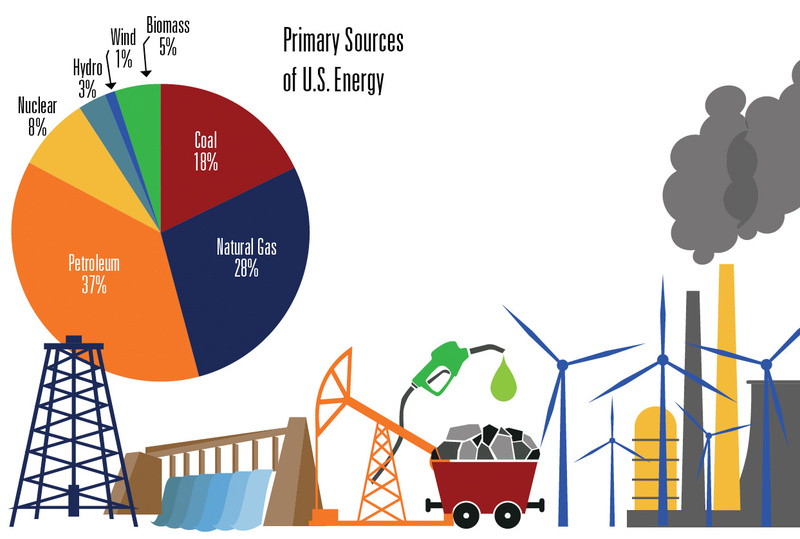 Total U.S. energy consumption (including, for example, heating and transportation) is equivalent to seven times the energy consumed in the form of electricity—so to generate enough power to satisfy all energy demand using wind alone, the country would need to install turbines in a north-to-south vertical stripe covering the middle, windiest, third of the nation. But covering one-third of the nation in wind turbines sounds draconian. It could have a harmful impact on predatory birds; it might also affect weather, Prentiss notes, and that should be studied. But if those turbines were built, landholding ranchers and farmers become the oil barons of the twenty-first century. In an electrified economy, people would drive electric cars, which would raise demand for electricity and lower demand for gasoline; fossil-fuel power plants would slowly be phased out. Existing plants would not be required to shut down prematurely, so electricity providers would not be hurt. A decrease in U.S. demand for petroleum would allow Americans to reduce petroleum imports, and might even enable substantial petroleum exports. Above all, the country would need only half as much energy as it uses today—because replacing fossil-fuel-dependent cars and power plants with renewably generated electricity would immediately reduce total energy demand by more than half (by eliminating that fundamental Carnot limit on efficiency). That means that instead of covering a third of the country, wind turbines would need to cover less than a sixth ofthe nation’s land area to meet average demand with wind power alone. Such a system would also dramatically reduce emissions associated with burning fuel. Prentiss identifies three considerable challenges to this vision of a national renewable-power system: the long-distance transport of electricity; the intermittency of the wind and sun; and the limited capacity to store renewably generated energy for later use. Transporting electricity from the nation’s heartland to the coasts, or from north to south, or from one coast to the other, would require building a national power grid, a substantial infrastructure investment. But science demonstrates that electricity travels well, Prentiss explains, especially in the form of direct current (as opposed to the alternating current that utilities deliver to customers). The U.S. Energy Information Agency estimates total transmission losses at approximately 6 percent, with long-distance losses around 5 percent per 1,000 miles for high voltage direct current. Such a loss in income might drive an accountant (like her spouse) crazy, Prentiss acknowledges, but “scientists talk in factors of two and 10”: thus, losses from distribution of electricity across thousands of miles are not big when compared with the orders-of-magnitude differences in generating capacity between the country’s most and least windy locations. The intermittency of wind and solar power is a bigger problem, she admits. Solar panels can’t make electricity when the sun doesn’t shine, whether at night or during cloudy weather. And on windless days, turbines stand idle. Today, regional utilities cope with this problem by maintaining conventional, fossil-fuel-powered electric plants with sufficient capacity to cover any renewable-source fluctuations. As of 2012, wind power represented just 1 percent of U.S. energy sources, but Iowa and South Dakota both generate more than 20 percent of their electricity from wind (as does Germany), demonstrating that fluctuations in supply and demand can be managed. As the role of renewable energy grows, of course, the intermittency problem becomes more challenging. Supply fluctuations are potentially more dramatic when there are more renewables in the energy mix, and could thus require more fossil-fuel backups to compensate. The simplest solution would be a breakthrough in storage technology, but Prentiss believes the challenge can be managed even without such an advance by combining existing storage solutions with a “smart grid.” Hydroelectric power, she says, provides today’s best large-scale means of storing energy generated from the wind and sun. Water stored in reservoirs and behind dams can be released to generate electricity as needed—and excess intermittent renewable power could be used to pump water up into reservoirs, to be released later when demand exceeds supply. In fact, hydroelectric capacity in the United States has remained steady since 1970, because development of new generating facilities has been offset by the removal of dams, principally due to environmental concerns. As the nation’s energy use has grown, therefore, hydroelectric’s contribution to the total supply has gradually dwindled. Because the nation’s pumped-storage hydroelectricity is limited, Prentiss suggests that, barring a technological breakthrough, meeting total U.S. power needs during the next 50 years will require combining existing storage capacity with a national smart grid. A smart grid that uses computers to manage electricity could take advantage of regional differences in power supply and demand, thereby decreasing the need for energy storage, that third big problem with renewables. For example, the sun sets almost four hours earlier on the East Coast than on the West (not three, as the time difference would suggest). Solar power generated in the West could be sold to customers in the East. Likewise, power demand changes seasonally, and according to different patterns in the South than in the North, creating opportunities for transferring electricity among states at different latitudes. Finally, the variability of wind averages out over distances of 1,000 kilometers or more, so a smart grid that stretched across the entire continental United States would be able to deliver a steadier flow of electricity from wind by managing long-distance transfers of power. Smart grids can also take advantage of distributed energy storage. Existing battery packs for electric cars can store approximately three times the electrical energy consumed by a household in a day. If every household had such a battery pack, the energy storage would approach the total daily U.S. electricity consumption. What is a sensible path forward? Prentiss says she wrote Energy Revolution out of a conviction that information is a powerful way to help people make decisions about energy use, whether as citizens or consumers. In order to effect change, then, her decision to focus on the largest, most inefficient sectors of the U.S. economy is pragmatic. Using government data, she divides consumption into four sectors and ranks their efficiency: industry, 80 percent efficient; residential/commercial, 65 percent efficient; electric-power generation, 32 percent efficient; and transport, 20 percent efficient. 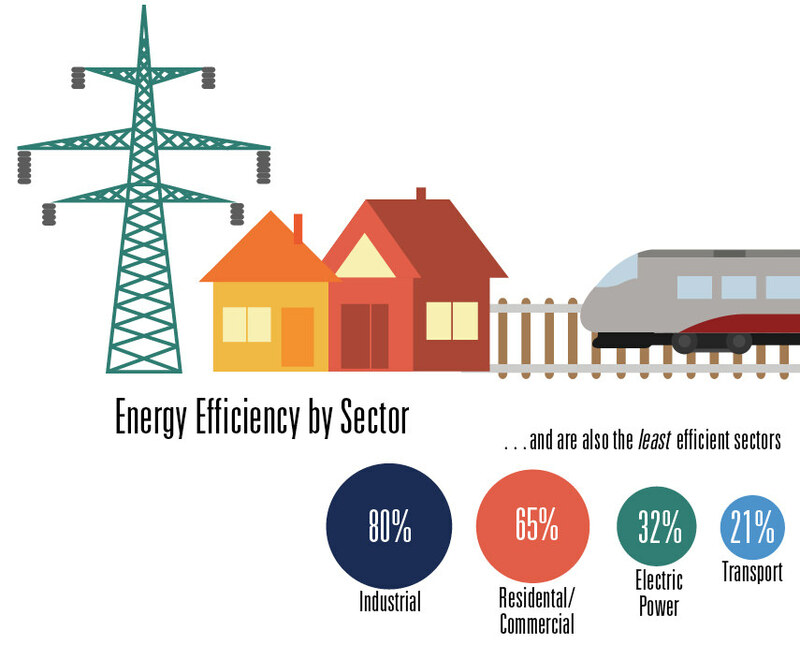 The data also reveal that the most efficient sectors are the smallest. 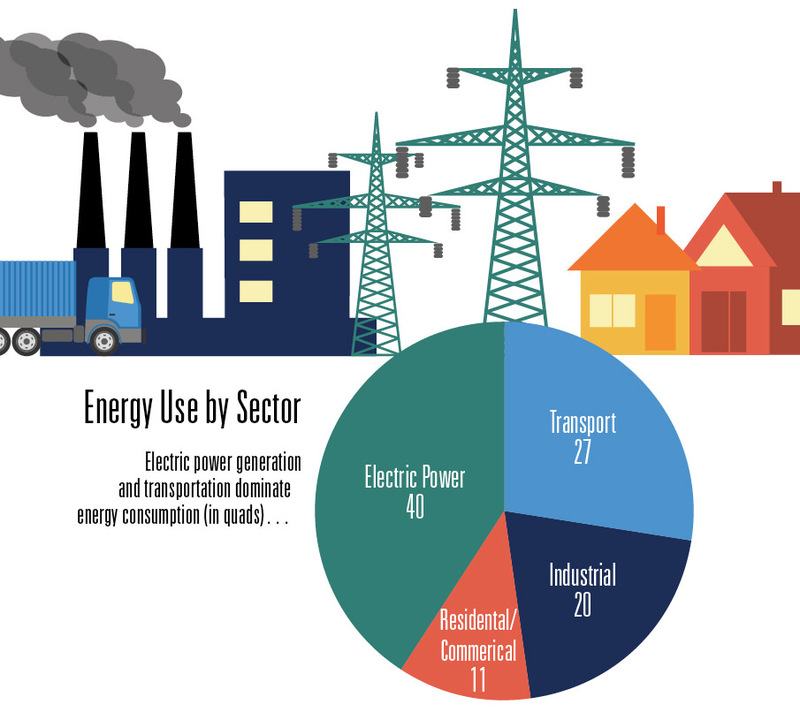 Of the nearly 100 quads of energy used in the United States annually, 20 quads are consumed by industry, and 11 go to commercial/residential uses. Transportation, the most inefficient sector by far, consumes 27 quads of energy, more than a quarter of total U.S. use, while electric- power generation uses 40 quads. Electric cars are far more efficient. Their motors waste a negligible amount of power (efficiencies can approach 99 percent), and regenerative brakes allow them to recapture and reuse much of the energy that propels the car. 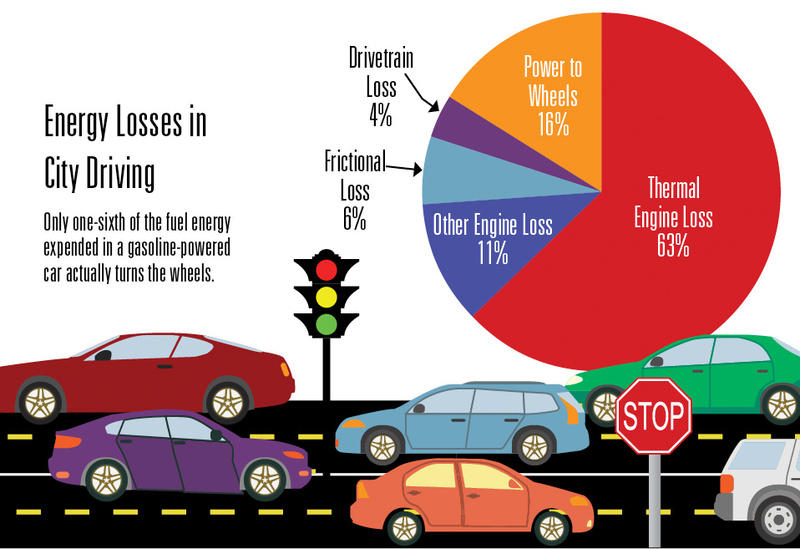 Overall, existing electric cars have total efficiencies that can exceed 60 percent. Thus, if gasoline-powered cars were completely replaced by electric cars, the electrical energy required to fuel them would be less than one-third the energy previously supplied by gasoline. But Prentiss is not advocating that everyone buy an electric car now. That would cause demand for electricity to spike, and force utilities to burn more fossil fuels. Getting to efficient electric vehicles, in other words, also requires system change. The efficiency of the car (and its impact on emissions) is only as good as the efficiency of the plant that generates the power used to charge the battery. If the power to run those cars comes from a wind turbine or a solar panel on the roof of a home, then the electric car makes sense. An energy economy based on electricity, including electric cars, must therefore grow gradually, Prentiss argues, with sources of supply and demand expanding in tandem in order to capture the efficiencies gained by eliminating heat engines. Furthermore, utilities must carry the capital costs of fossil-fuel-burning power plants on their books even as new renewable-power plants come on line. Her data show that meeting growth in demand for electricity (energy use grows over time) by building new renewable energy plants, without decommissioning fossil-fuel plants before the end of their lives, leads to the smoothest transition to a sustainable economy. Prentiss is realistic about the potential for change. Jets would still need to run on liquid fuel; doubling production of ethanol, a biofuel, could meet that need, she suggests. And even if the contiguous 48 states were to be linked by a single electric grid optimally combining wind, solar, hydroelectric, and geothermal power, she says that it would be more economical, in the near future at least, to burn some natural gas as part of that mix. A shift to renewable energy is already under way in the United States. In 2012, renewables passed nuclear power in the amount of electricity generated. Most of that new power came from wind and biofuels, the fastest-growing contributors to the the nation’s renewable sector. In addition, society is on the verge of benefiting from new kinds of efficiency gains. Computing advances, for example, could enable real-time modulation of supply and demand: imagine a hot summer day when air conditioning causes the demand for electricity to spike—and the batteries in electric cars provide a buffer during peak power use. Consumers could agree to run certain “smart” appliances such as dishwashers or dryers only when power demand for the day has ebbed. (Read about two alumni applying these technologies with utilities today.) Though Prentiss’s calculations don’t encompass this type of efficiency gain, nor the “socially wasted energy” expended heating and lighting empty rooms, idling in traffic jams, or driving around looking for a parking space, she points out, for example, that “smart” meters that signal whether parking spaces are occupied would be a win for everyone.